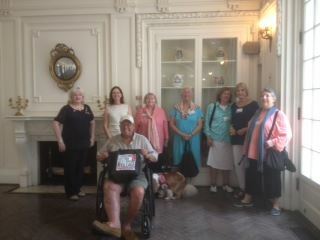 Taking advantage of their home town, several FBWE Villagers toured the DAR National Headquarters on June 17th. Dedicated in 1906, the headquarters features 31 regional and period American interiors from the 17th to the early 20th century. The entire city-block facility houses antiques, rare paintings, and the second largest genealogy library in the nation. Villagers were surprised to learn how accessible the collection is to all visitors. In addition, FBWEV members participated in a self-guided tour of the DAR Quilt Exhibit, “Eye on Elegance: Early Quilts of Maryland and Virginia.” The exhibit introduced participants to the little known history of early American quilts. The exhibit included quilts and their makers from Maryland and Virginia from 1790 to 1860. Villagers learned that the quilts were made from the finest imported fabrics of the time, and reflect the refined taste, style, and wealth of the women artists.